Most people who know me know that I don’t like to cook, which presents a problem because I love to eat. I plan meals, go food shopping, and throw meals together for the workweek for my family because I have to, not because I want to. That’s why I look forward to dining out on the weekends. There’s nothing like eating in a casual or upscale restaurant known for its delicious entrées, desserts, and top-notch customer service. Many establishments in Philadelphia offer such dining experiences but so does Houston, which has become a top-tier destination to eat and part of the reason I’m looking forward to going to the Academy of Nutrition and Dietetics Food & Nutrition Conference & Expo (FNCE) next month. Houston offers a distinct food culture that represents the city’s ethnic diversity at large and the many nationalities that populate the city. Award-winning chefs who own award-winning restaurants serve Texas BBQ/Tex-Mex, Southern cuisine, and farm-to-table fare using fresh, local seafood, crops, and beef, poultry, lamb, pork, and veal from the many nearby farms as choice ingredients. The city is known for its “Brooklyn-style” eateries, bistros, and gastropubs. And because its population includes people from across the globe, there are restaurants that can satisfy every palate. Some call Houston a veritable melting pot of ethnic cultures. You can find every type of food, from Chinese and Thai to Cajun and Transylvanian. There’s even a French-Vietnamese restaurant that serves a modern fusion of French and Vietnamese food. 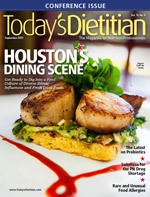 To learn more about these extraordinary eateries and where they’re located, turn to “Houston’s Diverse Dining Scene”, our annual dining guide, on page 26. Your mouth will be watering, but make sure you turn to the article “Parenteral Nutrition Drug Shortages” for practical solutions to this ongoing challenge. The feature “Friendly Bug Invasion” discusses the latest probiotic products on the market and how to counsel clients to choose what’s best, and the article “Going Nuts” reviews the heart-health benefits of nut and seed butters and provides recipes to share with clients. Please enjoy this issue. See you in Houston!